Transitions and Transformations features Terra Linda student work in fine art, ceramics, graphic design, digital art, and photography. As a “military brat” who traveled extensively, I have always been fascinated by people in other cultures - their unique faces and personalities. From early on, the main focus of my work has been portraiture. At the age of 14, I studied briefly with Guy Bernardo, and after receiving my first portrait commission while in high school, I was hooked on becoming an artist. I married into a very musical family and, not having a single ounce of musical ability, became an avid listener and lover of all types of music. Unable to create music, I turned instead to painting to express my appreciation of both musicians and dancers, trying to capture them in the act of doing what they love. I enjoy working in the studio, doing figure studies while listening to anything from blues and rock to opera and classical. The paintings in “Music in the Air” depict a variety of performers - professionals onstage with dramatic lighting, casual outdoor street musicians, dancers waiting in the wings. Alternating between oils and pastels, I let the subject and the quality of light I wish to achieve dictate which medium I use.I always try to capture a subject’s unique personality or mood, especially as reflected in their eyes or a certain gesture. Blackbirds © Susan Press, ceramic, 17" x 9" x 9". 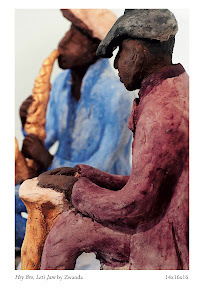 Since the early 70’s, I have been working primarily with ceramic clay. I studied art at the San Francisco Art Institute with focus on lithographic printmaking and hand-built ceramics. I studied under Richard Graf and Richard Shaw. Using both low and high fire clay I construct variations on the human figure. 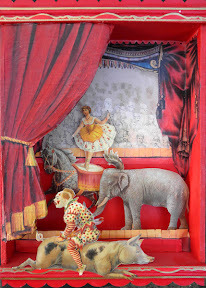 Sometimes the form takes that of hanging puppets and other times free standing or walled-boxed figures. My work has often been described as illustrative. With each piece I do attempt to tell a story either with the figure or figures in the piece, and/or the materials I use to embellish the work. Photo strips are chosen to relate to the figures and their expressions. Found materials are meant to trigger a memory or personal story in those viewing a figure. I hope to sometimes stir emotions including delight and humor. The Centro Cultural de Guatemala organization presents a collection of traditional Guatemalan celebration clothing. Designs across skirts, head-dresses, shirts, jackets, and more represent individual villages and feature bold colors, symbols, and patterns. This clothing—called traje—is an essential cultural practice, preserving Mayan history and Guatemalan identity. Drawing from his extensive collection of peculiar 19th century photography as well as classic public domain images, Eric Kelly uses digital processing to combine and transform antique images into surreal dreamscapes and assemblages. He constructs the artwork in layers of metal leaf, digital prints, found objects, and resin, mounted on wooden panels or antique printers trays. Some of his artworks use multiple layers of clear resin to float images and objects in three dimensional space, creating the illusion of being suspended in liquid. The end result can be unsettling, with viewers finding themselves face to face with the unflinching gaze of portrait sitters long since forgotten, but now revivified within a strange dream tableau. Described as “curiously grim” by SF Station, his art can also be darkly humorous – one print series transforms unintentionally absurd old photos into storybook illustrations, complete with florid Victorian-style captions. Resembling a theater set more than the whitewashed space of a typical art gallery, the installation showcasing the art is designed by Rodney Griffin, for many years associated with the Edwardian Ball, and a founding member of Le Mysterium Art Collective. His whimsical lamps, often with antique cameras as the base, perform dual duty as gallery lighting and decor. Eric Kelly studied art at California College of Arts and Crafts, and over the years explored lithography, paper making, traditional collage, drawing, graphic arts and commercial design. Although he now uses sophisticated digital imaging, his artwork remains rooted in tangible, meticulously assembled materials, and harkens back to an era when the boundaries between fine art, craft and decoration were less strongly drawn than today. Morning Fog © 2018 Molly Brown, oil on board, 9” x 12”. An exhibition of images seen from a bird’s perspective. This collection of mostly new work in oil includes seascapes, landscapes and abstractions of the natural world. Natural colors, patterns and atmospheres are paramount. Artist Molly Brown has been trained in scientific illustration and pays great attention to detail in her artwork. This new work is a departure and focuses on mood and color, abstracting land and seascapes. All of the work can be imagined as how a bird might perceive the world while flying or perched on a branch. Changing the viewer’s perspective is the desire and goal. Liz Schiff and Lynette Porteous are long-time friends and watercolor artists. Liz is also a long-time monoprint artist. These two artists showcase paintings that reflect their interpretations both of what they see and what they imagine. Inspired by a recent trip to China where she purchased an assortment of calligraphy papers, Liz combines these Chinese papers with bird imagery in a series of mixed media monoprints entitled Flight to China. Liz uses a variety of textures and colors to create paintings that are often whimsical, often lyrical—each one with a different story to tell. Lynette takes her inspiration from the world around her. This exhibit features her beautifully rendered watercolor landscapes. With a rich palette of exquisite color combinations, Lynette's paintings infuse the viewer not only with a sense of place, but also with a sense of wonder. Bodie Revisited © Larry Robert Davidson, photographic collage construction, 5" x9". The Collage Series. A life in photography reimagined. Fairfax photographer Larry Davidson has taken 45+ years of accumulated prints and given them a new and inspired second life as one of a kind collage works of art. Re occurring themes in these new pieces are the sky, sunrise, sunset, the moon, water and repeating geometric shapes and colors—colorful, vibrant and unique. Since the 2016 elections, events have been troublesome and the future uncertain. My purpose in this exhibit is to question our global situation in these disturbing times. My paintings are visual stories, which I emotionally charge to engage the viewers to question what they see and how they feel. Manuila has participated in many group exhibits, among which at the Napa Valley Museum in Yountville, CA, the Moca in Novato, CA, Art Works Downtown in San Rafael, the Southern Nevada Museum of Modern Art in Las Vegas, NV as well as Dacia Gallery and First St. Gallery in NYC. Sanda Manuila creates oil and pastel paintings, which are stylized representational images from which exude an allegorical quality. Her visual stories depict a state of mind in which the boundaries between dream and reality have become very fluid. Her purpose is to make art that depicts the challenging path of life, and what it entails to be a woman in an intimate, social, cultural, and universal realm. In light of the California fires, immigration issues that many of our high school students and their families are facing in the context of the recent polarizing political and social change, Terra Linda art students explore and question the meaning of Home and Refuge and Sanctuary. Home is often seen as a place of refuge or sanctuary, but sometimes it's not. Where do we look for solace then? Where do we find peace, quiet, and a place to reflect or to get away from problems or stresses? Where do we feel safe? Is that a place, or an activity? Glenwood Labyrinth, San Rafael © Cindy A Pavlinac, photography. © Cindy A Pavlinac, photography. Professional photographer Cindy Pavlinac has dedicated herself to exploring sites of ancient wisdom and community. She works intuitively using the camera as her tool to communicate the beauty, mystery, and power of place. Labyrinths largely influence her work, both in the metaphor they represent and the grace of their simple geometry. Journeys of Renewal: Contemplative Photography will include images of local and historic labyrinths as well as other places of great presence, and the gallery floor will be transformed into a walkable labyrinth installation. In addition to her images of labyrinths, Journeys of Renewal: Contemplative Photography will feature other pictures of sacred spaces that invite reflection and provide viewers moments of quietude. It will also include a selection of Cindy’s newest body of work: colorful, abstracted photos of water and nature printed on metal. Cindy Pavlinac is a fine art photographer, multimedia presenter, and exhibiting artist. Her images have won numerous awards and appeared in publications such as Time Magazine’s Pictures of the Year, 2002. She presents internationally at venues like Oxford, is an Art History instructor at Dominican University, and offers individual photography mentoring. Please visit her website: www.capavlinac.com to see more examples of Cindy’s art and publications. A gift book, “Marin Labyrinths, Circling Home, Photography & Prose by Cindy Pavlinac” will be published to accompany the exhibit. This exhibition showcases wonderful artwork by the Sweet Spirit Ceramics students. The variety of hand-built and thrown works will surely illuminate your spirit and tickle your imagination as well as showcase the skills of these ceramic artists. Imagine Pablo Picasso in a three-piece suit, and you’ve imagined Bob Urban. He began making art as a youngster, but soon faced an obstacle: he had to earn a living. After tours in the US Navy, University of Southern California, the University of New Mexico and the University of California, Berkeley – where he nourished his artistic impulse by creating posters for car dealers – he got a hair cut, donned a suit, and went to work for Life magazine, first in San Francisco, then in New York. Next stop: Helene Curtis in Chicago. Then it was off to San Francisco and the beginning of a career in advertising and marketing that eventually led him to launch his own marketing consultancy—still wearing coats and ties, and making art for his kids and grandkids after hours—until he turned 70. Whereupon he sold his consultancy, donated his coats and ties to the Salvation Army, and turned an after-hours avocation into a full-time pursuit. The consequences can be enjoyed in this exhibition, which features drawings and paintings of portraits, landscapes, and fantasy. Working under the moniker Magick Number, Michael and Alina Campbell have collaborated on an interactive art event for one evening only. Join us this Friday the 13th as they host The Wild Hunt, a carnivalesque shooting gallery in the lower level at Art Works Downtown. The Lopsided Boogie and How She Came Out of Darkness, is best described as performance work created for film. The main character, Lopsided Boogy, tries to navigate her way through a dark but dreamy world where white grease-painted clowns feast at a chaotic and decadent tea party. Accompanying the film is a selection from Benicio's series of mixed-media photographic compositions which depict her fantastical creatures moving through strange worlds. Artifacts of Intention is a process oriented body of work that reflects a desire to rediscover a long lost love of drawing while embracing art without ideas. 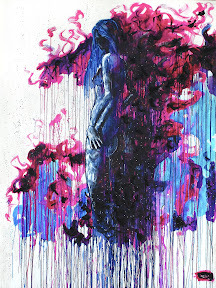 Utilizing repurposed or modified power tools and nontraditional techniques of mark making Nate Castillo surrenders a measure of control and allows the work to become a collaboration between artist and tool. 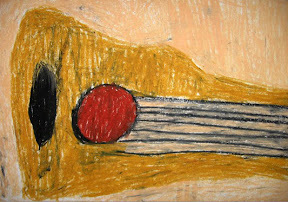 The result is a drawing that Nate witnessed develop while embracing the artifacts of his intention. "A Face from Every Angle"
In 1976, UC Berkeley Anthropologists determined that the first inhabitants of California occupied Ring Mountain in Corte Madera some 8,000-12,000 years ago. Their lives centered around their "God" (a now dormant volcano), fertility, and the strange creatures around them. These technologically advanced people recreated images of these forces on their tools made from stone, wood, pyroclasts, glass, and metal. Seventeen years of research and discovery have produced the largest collection of its kind. All items in this exhibition were collected in Marin. The visual archeology of color through time. The painting is time compressed, and its drama is color as seen through a lens. Point and background. Discourse and dissonance. Layers and territories. Eruptions and histories. Movement and decay. Through shifting light and mood the stories are told in time, as time itself is captured and held by the endless light of the painting. Artists: Malaya Gibson, Coral Kiefer, Sophia Santa, Jillian Shea, Emily Hamilton, and Sarah Egas. Tonal Range is a photography term used to describe a range of value. This exhibit showcases work exploring range and value to the depths of their meaning, recycling the term tonal range to apply to time and humanity. TL Visual Art students give voice through drawing, painting, photography, and ceramics to themes of identity, issues and ideals in this time of change and uncertainty. indigo landscape © 2016 Barbara Bryn Klare, indigo-dipped paper, 18" x 24"
In November 2016, I was artist-in-residence at the Icelandic Textile Centre in Blönduós, Iceland. Blönduós is a small town in northwestern Iceland where the glacial river Blanda meets the Arctic Sea. The pieces in this show were inspired by my time there and in Akureryi, where I stayed in a weaving studio. Louise Finn Gould states: "In my work I seek a balance between the real and the imaginary. I am inspired by the beauty and majesty of nature. I am intrigued by my dreams at night. I am in awe of the ever changing sky and how clouds shift and change. I am touched by family photographs, both my own and others, often capturing subtle connections and emotions. I am committed to the journey of creative exploration. I believe that each person has a unique voice and expression that is there for their discovery if they so choose. It is my hope that my own personal expression of creativity will spark in others a feeling or memory." Emerald Forest in an installation inspired by Stephanie Jucker's father, whose extreme passion for nature and art was only matched by his intense addiction to alcohol. His favourite drink came in a green bottle and this has coloured her memories of him. The gin bottle glinting green like an emerald, glowing green like poison. Below are some of the works that will be in the exhibit. For more information and prices contact me directly. Marnago was born in California, but grew up in Latin America and Europe. In addition to his degree in history, Marnago is a creative spirit and an autodidactic, artist, writer, and poet. This show illustrates the many ways Lucille created her work for over 25 years. She was influenced by the three main places she lived and worked—Bay Area,Tassajara Zen Center, and Kauai, Hawaii. Lucille created her work from 1959 to 1984. She studied at the San Francisco Art Institute and San Francisco State University. She was very active in the San Francisco arts community. Her work was shown at the Palace of the Legion of Honor, the Art Institute, and the Museum of Modern Art in San Francisco; the Oakland Museum of California; the Richmond Art Center; and the National Gallery of Art in Washington, D.C. In Hawaii, her work was shown at The Garden Island Art Center and the State Building in Kauai, and The Honolulu Academy of Arts. In addition to this she had work in many galleries and many private collections. Liz Schiff and Mimi Makowsky are long-time watercolor artists who also share a passion for monoprints. In this exhibit, both artists showcase recent works that juxtapose monoprinting with painting, marrying the unique textures of printmaking with the transparent characteristics of watercolor. Works by Liz Schiff feature her "By the Wind Sailor" and "By the Fly" series. The "By the Wind" series was inspired by jellyfish known as By-the-Wind Sailors that periodically wash up on Northern California shores. Liz makes impressions with the dried "sailors" and other material, and then paints back into these monoprints to create unique underwater-like imagery. Also included in the show are pieces from Liz's "By the Fly" series where she uses primarily butterfly and leaf imagery to create small flights of fancy. Working in watercolor enhanced with both monotype and transfers, Mimi Makowsky explores a sense of place and renewal. She uses recurring themes of light and vegetation to express her enthusiasm for a new phase of life. The 138 Houses We Lived In When We Were 10, Drawn From Memory Alone is a show about our visual and anecdotal memory of our childhood homes. Since 2013, I have interviewed 138 people about the house they lived in when they were 10 years old. I had each person draw their childhood home from memory alone without looking at any photos or contacting family for information. If they could not remember a detail of the house, say, where the windows were or the type of roof the house had, it was left out of the drawing. The focus is on the visual memory of these houses as opposed to an accurate representation of the houses. I then recorded each person telling a story about their house. Artwork by juniors and sophomores majoring in studio art or graphic design at Dominican University of California. Curated by students, the artwork represents a theme, medium, or concept they are currently exploring. Transformation, alteration, and adaptation are explored in a variety of media created by the Visual Art students at Terra Linda High School. Student works combine elements of the natural environment and personal perceptions as a response to the interconnectedness of their changing world. X-Men © Sheri Rice, collage, 8"x10"
Frida Kahlo © 2014 Joe Hayes, mosaic, smalti, 18"x14"
Mission:Empower and expose at-risk young adults to experience a world outside of their own through volunteer and cultural experiences in their community and abroad. Honker, Phyllis Thelen, © 2014, Okra pod, bamboo, coconut fiber, paper, ginkgo pods, 26" x 22" x 9"
Vibrant, richly colored, and dimensional. Dan uses found and discarded material, neon tubes, blown glass, cast metal and paint in various arrangements. 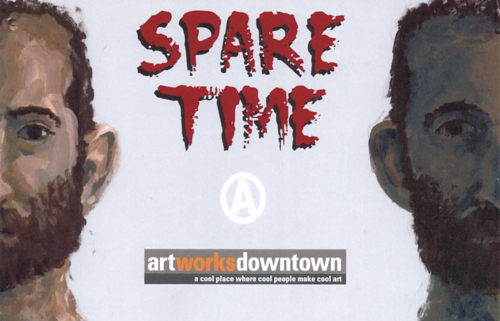 an exhibition of art works downtown staff • one night only! "You Are What You See . . . Take a Closer Look"